Cruise industry folks know that vacationers have literal boatloads of sailing options to choose from these days, inspiring the trend to outfit ships with the most whiz-bang attractions and amenities at sea. Today you’ll find souped-up ships oozing outrageous features — such as amusement park-worthy diversions (racetracks with hairpin turns), high-tech innovations (robot bartenders) and Instagram-worthy settings (from ice bars to underwater lounges) — as the lines try to one-up each other to get you to travel with them. Here are 10 unusual cruise ship amenities to ensure you’ll be anything but bored once you’re onboard. 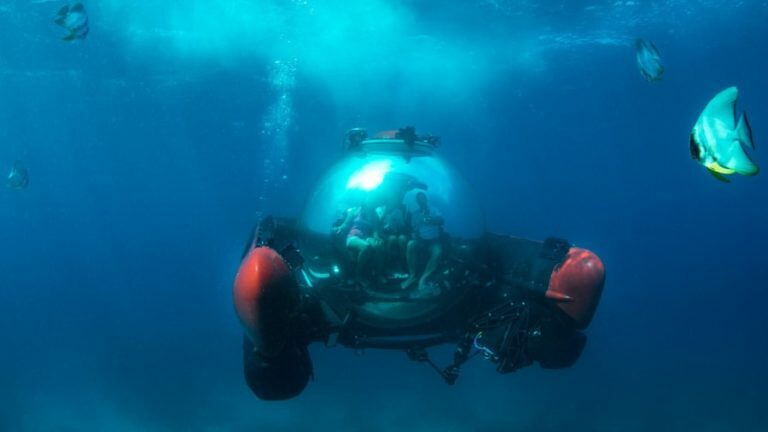 This pressure- and temperature-controlled submersible, large enough for a pilot and two guests, can bring passengers down to depths of nearly 1,000 feet. The sophisticated C-Explorer 3 vessel is outfitted with a see-through, 360-degree acrylic capsule for optimal observation. It is agile enough to allow viewing of whatever ocean treasures await below — from colorful coral reefs to shipwrecks — on the roughly 30-minute dives. 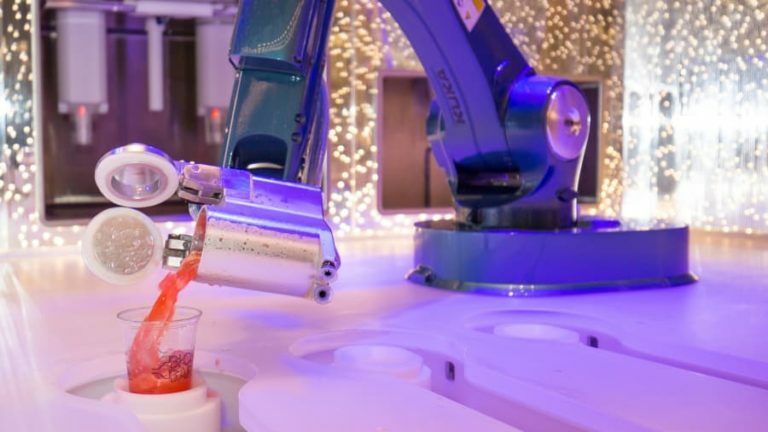 Let Royal Caribbean’s robotic bartenders shake things up on your next cruise. A duo of them literally shake and stir drinks up at the “mixology meets technology” Bionic Bar, found aboard several Royal Caribbean ships (including Harmony of the Seas, Symphony of the Seas and the line’s three Quantum-class ships). Place your drink order via tablet. You can pick from specialty drinks or design customized cocktails with more than 30 spirits on tap. Then watch the show-stealing pair of robotic arms get to mixing before serving up your concoction. The one caveat? There’s no program for them to listen to your problems — yet. Got a need for speed that your ship’s leisurely knots just can’t satisfy? 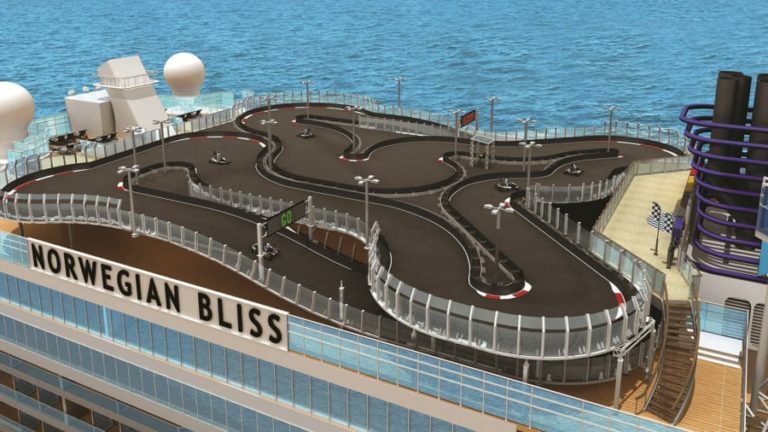 Norwegian answers the call with the largest racetrack at sea aboard its new Norwegian Bliss. The open-air, 1,000-foot-long track offers great views out over port and sea — that is if you manage to catch them while reaching speeds of up to 30 mph. The winding, two-level track offers hairpin turns and the chance to leave your competition (of up to 10 drivers) in the dust — though note you won’t be able to actually rev your engines since the electric race cars run silently. 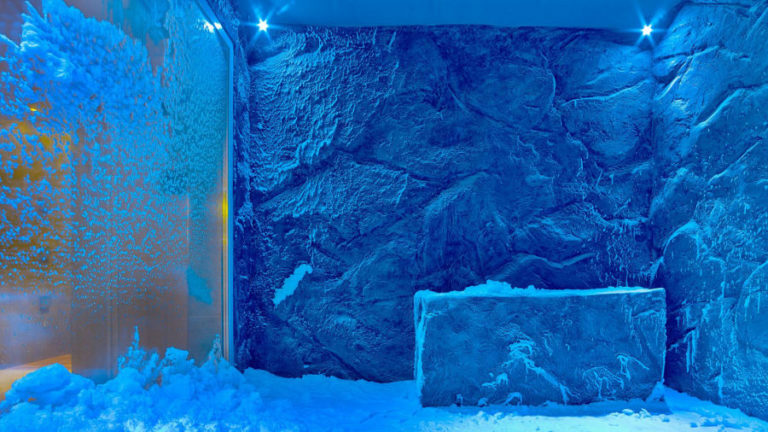 Part of the LivNordic Spa’s thermal suite area aboard Viking’s four ocean-going sister ships, the “snow grotto” pays tribute to the line’s Nordic heritage and Scandinavian sensibility. Designed to invigorate and stimulate the circulatory system of guests who don’t mind a chill, the small, snow-covered room pipes in cold air as snowflakes fall from the ceiling. And if your preferred way of chilling out is to heat up, you can always get your fill at the adjacent steam room and sauna. Upscale French expedition line Ponant is rolling out an industry-first underwater lounge dubbed the Blue Eye aboard six of its new Explorer-class ships, debuting through 2020 (the first, Le Laperouse, launched in June 2018). 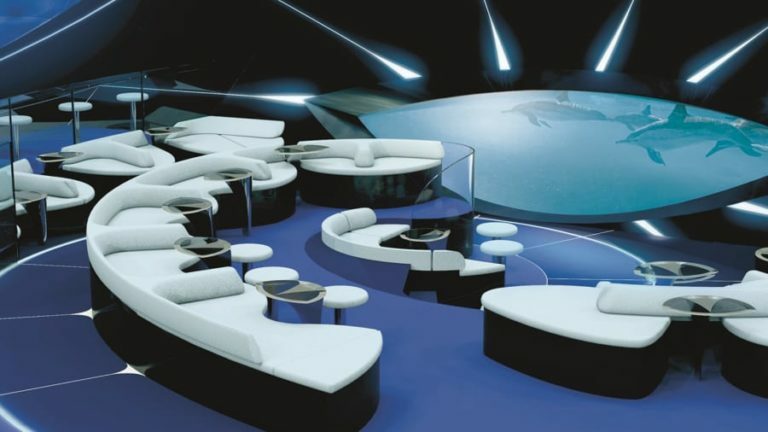 Designed by architect Jacques Rougerie — known for creating transporting underwater structures — the high-tech space is angling for a multisensory experience that will invite guests to a mod, vibrating lounge set below the ships’ water line. There, two large glass portholes offer a window out onto the underwater world, further augmented by digital screens projecting live images from a trio of underwater cameras, as well as a sound system streaming in subaquatic hydrophone-captured sounds. Get ready for your very own E.T. moment aboard the SkyRide aerial attraction, found aboard Carnival’s newest ships, Carnival Vista and Carnival Horizon. 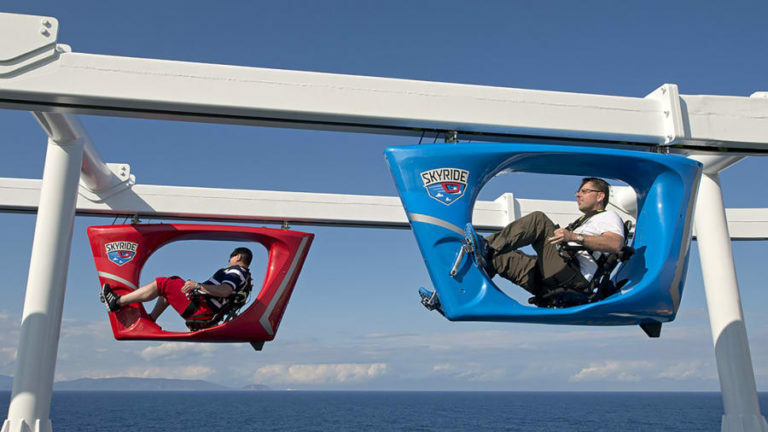 The innovative offering lets adventurers put their pedal power to an 800-foot-long suspended outdoor track that’s elevated atop the ship’s top deck, 150 feet above sea level. The quartet of dangling recumbent-style bicycles can reach speeds of up to 18 miles an hour on twin tracks, but you may want to take it slower to enjoy the killer views. 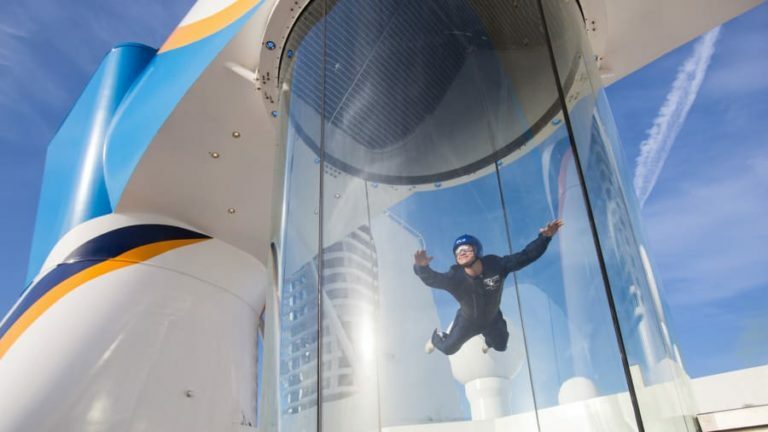 Innovator Royal Caribbean — responsible for industry firsts such as rock climbing, ice skating, zip lines and surfing simulation — has also brought the first skydiving experience to sea with its RipCord by iFLY attraction, available on its Quantum-class ships. Adrenaline-seekers can get a taste of simulated skydiving on an open-air deck — affording stunning sea views as they spread their “wings” and experience what it’s like to float on air in the 23-foot-high wind tunnel. A brief training course, flight gear and hands-on instruction help ensure that levitating like a pro is a (strong) breeze. 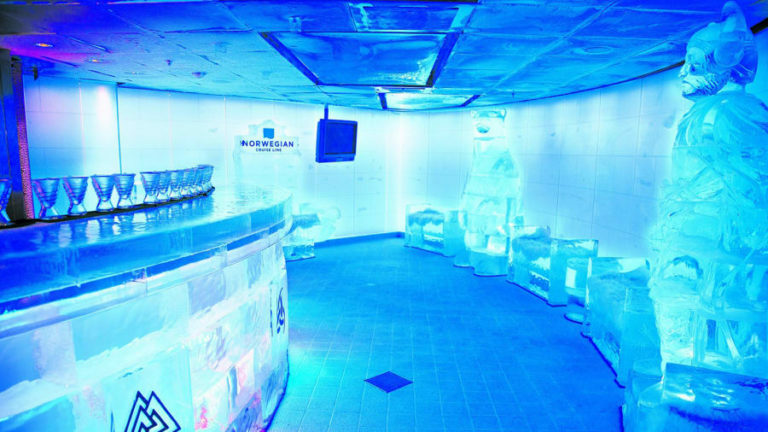 The coolest bar on the high seas, Norwegian’s Skyy Vodka Ice Bar invites cruisers to bundle up and throw back a frosty drink aboard the Norwegian Breakaway, Norwegian Getaway and Norwegian Epic. Temperature-controlled at a brisk 17 degrees Fahrenheit (- 8 C), the $20 admission gets guests 45 minutes to chill out at the frozen bar and take in the decorative ice sculptures; two specialty beverages (including Skyy vodka-based cocktails), served in carved-from-ice glassware; and, mercifully, the use of hooded parkas and gloves. 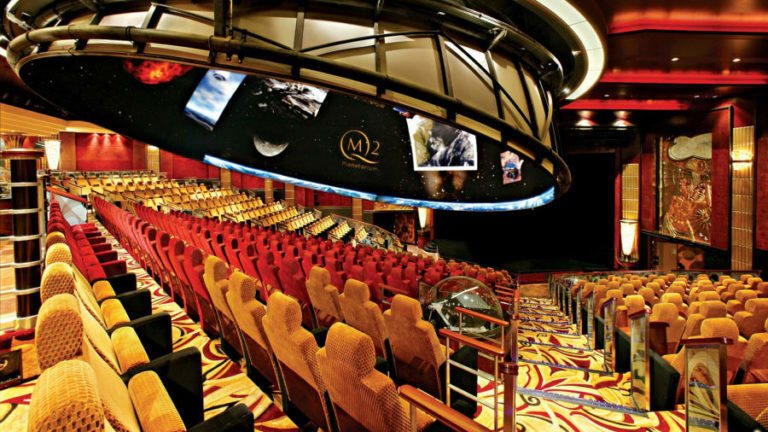 Cunard Line’s refined Queen Mary 2 boasts the only full-sized planetarium at sea, which is housed in its Illuminations theater. Passengers can partake in plenty of programming under the giant dome (it’s large enough to accommodate 150 reclining seats), such as narrated star shows, virtual reality rides and special presentations and lectures in partnership with the Royal Astronomical Society. If you’re a true outer space enthusiasts, board during the ship’s “Transatlantic Space Week” voyage (embarking New York City on October 7, 2018) to share the planetarium — and the rest of the ship — with special guests that include a former NASA astronaut. 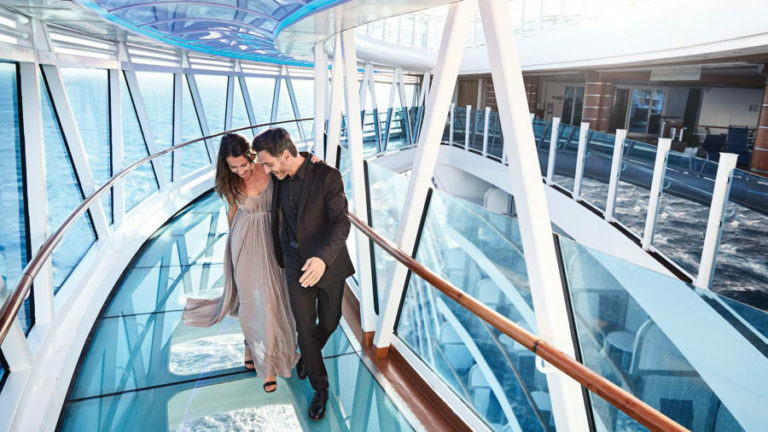 Walking on water is par for the course when you sail on one of three Princess ships (Regal Princess, Royal Princess and Majestic Princess) outfitted with the line’s signature overwater SeaWalk feature. See the sea from a bird’s-eye perspective while strutting across the 60-foot-long, glass-bottomed walkway, which cantilevers the ships’ sides by 28 feet. Those lacking a head for heights needn’t apply: SeaWalk overlooks the ocean waves 128 feet below, from a perch atop the ships’ 16th or 17th deck.